With bottlenecks a routine challenge for busy job shops and OEMs, it’s not uncommon to find the press brake as the primary culprit. For many shops, gaining efficiencies on the press brake can help mitigate these holdups and improve part flow throughout the shop. California-based Pinnacle Precision Sheet Metal Corp. found itself with such a bottleneck. The manufacturer of electrical components for audio, medical and aerospace equipment views throughput as one of its major production challenges. For the past few decades, McLaughlin and his team have used Amada-style punch holders for the press brake as well as a quick-release manual clamping system from Wilson Tool International, White Bear Lake, MN. In its efforts to reduce bottlenecks and increase throughput, Pinnacle Precision recently implemented a new punch-clamping system that uses shop air as the power source. Designed by Wilson Tool, the new Express Air clamping system clamps and seats front and back tools simultaneously using a single pushbutton remote. This quick-change technology has helped Pinnacle Precision reduce setup time by eliminating the need to hand-tighten set screws and manually seat the punches. 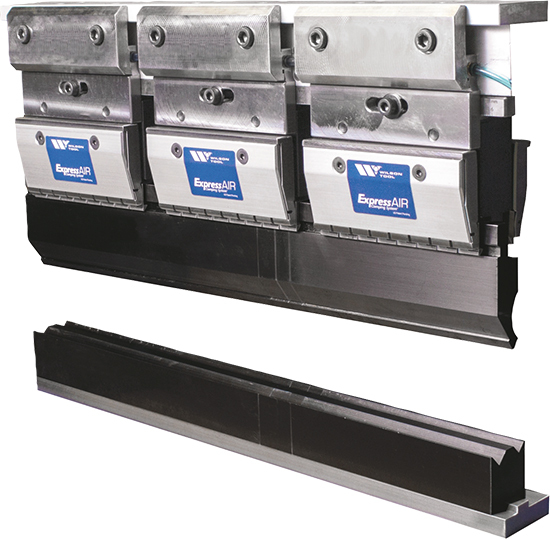 Powered by standard shop air at 90-120 psi, the clamping system also allows operators to set up gaps between punch holders to create an ideal setup for box bending. Since implementing the air-powered clamping system, Pinnacle Precision has noticed cost savings throughout the shop as well as time savings.